6max or FullRing, Which Poker Format Should You Play? Most likely you just down and played at the first game you saw. That’s fine when starting out; but it is important to realise that there is big a difference between these two poker formats. As a result, you will require different strategy for you to come out on top and win the most money from each game! The primary and most obvious difference between fullring and 6max is the number of players allowed to sit at each table. For a fullring table the number of players allowed is typically between 7 and 10; whereas for a 6max table between 4-6 players at any one time can sit down. Fullring is a more popular format in casinos as they only have to pay one dealer for 9 or 10 players. Whereas 6max tables are more popular online because you can play more hands per hour profitably. But both formats are found at either locations so it is important to know which one best suits you for the next time you go to sit down to play. So why is the number of players important? The number of players on the table left to act will define the type of hands you will play – or in other words how many hands you will play. If lots of players left to act, we will have to play an extremely tight range. This is because the chance that someone will have a very strong hand is quite high. On the other hand, if you play a shorthanded game such as 6max the number of players will be less; thus you can play a wider range of hands. This is because probability someone has a very strong hand is much lower. Lets look at an extremely strong hand, take for example JJ. There will be a 1.5% chance of an other opponent having a better starting hand with heads up poker (1 opponent) – in other words, not very likely. 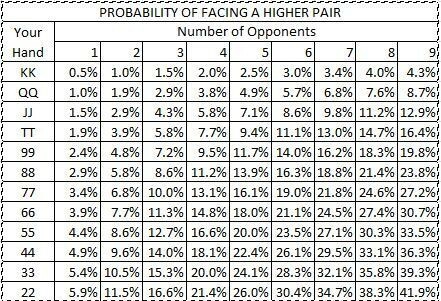 With 6max that probability increases to 7.1% (somewhat likely) for 5 opponents; for a fullring table with 9 other opponents that rises again to 12.9% chance. In fullring with 22-77, it doesn’t make sense to raise them first in from UTG (8 or 9 opponents). There is a high probability that someone could already have you beat; if not they could potentially have 2 overcards (such as AQ or QJ for example) which will have just under 50% equity vs your hand. In either situation you are not in great shape! Therefore the strength of hands decrease as the number of opponents increases. This was covered in more detail in position is king! 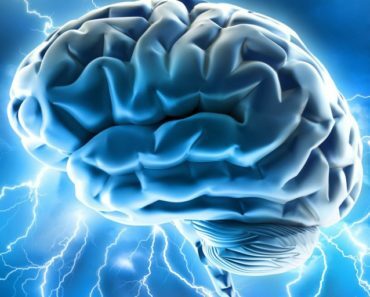 A good way to understand concepts is to think about extremes. Lets extrapolate this out to a table with 100 opponents (not possible due to the number of cards in a deck but let’s run with it). It would be clear the only hand that worthwhile would be AA and possibly KK. Lower pairs would be likely to be already beat. Thus, the larger the number of opponents, the stronger you hand needs to be to enter the pot! Another major between fullring and 6max is the amount of time spent in the blinds. When you a play a 10 player fullring table you will be in the blinds 2/10 times or 20% of the time. For a 6max table you will be in the blind 2/6 times or 33% of the time. So for a 6max game you will spend over 50% more time in the blinds than a full ring game. This is not something to be ignored; you will almost certainly lose from the blinds no matter how good of a poker player you are. If out of position is difficult for you, which is typical for a beginner, you will want to avoid being in the blinds as much as possible. Therefore playing fullring tables might be the best solution when starting out. 6max games are typically more aggressive than fullring games due to the blinds come around more frequently. In addition, the strength of each individual hand has increased when compared to fullring (see the hand chart). This will mean it’s appropriate to get all in preflop with AA-QQ and AK in a 6max game; compare this to KK+ which would be more acceptable range for fullring. As 6max players play more hands, are more aggressive and face more aggression, they will be better equipped from a skill level standpoint than an equivalent fullring player. One of the best ways to learn and improve your poker game is to play more hands. This is difficult when playing full ring as starting hand strengths are so poor when there are lots of players left to act. The majority of your hands will be folded where you learn very little. Since you will play less hands in fullring, it will be an easier game to adjust to as a beginner. 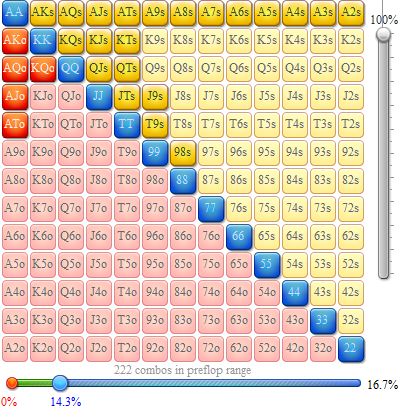 In fullring games player’s ranges will be more defined and easier to play against and exploit. Also, more often than not in fullring games you can avoid getting into marginal spots where you are unsure of the correct play. Marginal spots are where you are most likely to makes mistakes. Mistakes are what ultimately lose you money. The variance of fullring games is lower than that of 6max game. The typically standard deviation of a fullring game is approximately 60-80bb/100; whereas for a 6max game that will be 90-110bb/100 depending on your exact play style. Lower variance means that the swings you experience will be much smaller – this is beneficial particularly if you haven’t got a large bankroll to start out with. Since fullring games play at a slower pace, it allows you to sit back and watch hands take place, learn and take notes on your opponent. This is the introduction most players need to the game as opposed to the super aggressive 6max games. Finally, it was shown that the best 6max players typically have higher win rates than full ring counterparts; however the biggest losers were also at 6max. So if you’re new to the game it may best to still with fullring to learn the game while limiting your losses. One of the main benefits of 6max is that you will play more hands and thus you will learn quicker. But let’s not forget that the reason we play poker is to not sit down and fold all day. We want to have fun and play as many hands as possible. For that reason fullring games can be quite boring for some players. This is especially true if you don’t play online where you can multitable. 6max is a better choice of game structure the larger the skill difference you have over your opponent. The primary reason for this is if there is a bad player on the table you only share him between 4 other players. When at a fullring table you may have to share him with 7 or 8 other players . In a fullring game, if a bad player sits down it will be very difficult to isolate him and take his money unless he is seated next to you. Often by the time you get a hand worth a raise, the bad player has already lost his stack and has left the table. In addition, 6max games are available at higher limits than fullring tables online. Once you get past 100Nl for fullring tables it becomes difficult to find profitable games. This is not really an issue for 6max games as they are much more popular online. However at lower limits you should have no problem finding a suitable game for fullring or 6max. So don’t worry if you have just started out. Furthermore, 6 max better prepares you for tournament shorthanded play. At the final table of a tournament, the structure will change as more players are knocked out. Most fullring players are not prepared for shorthanded games as it play very different to a full table game. This is where 6max players will excel in a tournament. Although both games play differently, the skills you will learn in either game will be transferable. So don’t worry, if you want to change over; it may just take some time to adjust. For a beginner, there are many benefits for fullring games – you limit your losses when compared to 6max games, have fewer difficult decisions to make, and more time to make each decision. Personally, I started out at fullring and when I eventually changed over to 6max as I found it more exciting – the reason we all play poker, for the thrill. But I had the basic fundamentals down before I even thought of 6max. So take that into account if you are a complete beginner. Ultimately you should try both formats and play the one which suits you best; taking into account everything already mentioned. But what you will most likely find is that as you get more experience you will tend towards 6max; it is generally thought to be a better and more exciting game structure. Any other differences between fullring and 6max? Please let us know. 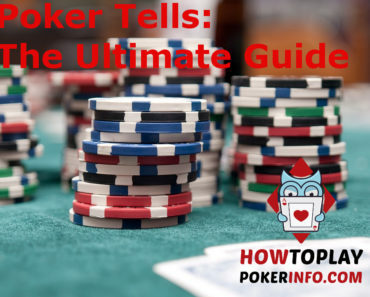 Want To Hear More From HowToPlayPokerInfo?